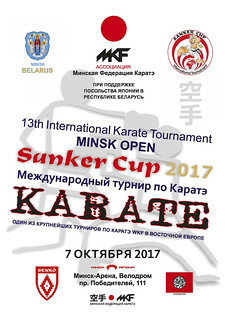 On behalf of the SANKER CUP Organizing Committee, we have the honor to invite You to the 14th International Karate Tournament "MINSK OPEN - SANKER CUP". Tournament will be held at October 12-13, 2018 in the one of the best European sports complex "Minsk-Arena". Registration for SANKER CUP 2018 will be available from September 1 at and our site. Referee seminar – 17:00 and further in Calgary Conference Hall. Mandates Commission – 15:00–19:00 in London Meeting Room. The tournament is officially a part of the program of the festival "Japan Autumn in Belarus", conducted by the Japan Embassy in the Republic of Belarus. A letter about the inclusion of the tournament in the festival program (Russian only) is available below. Information on rules of visa-free travel available at Ministry of Foreign Affairs of the Republic of Belarus website. The rules introduce the visa-free entry through the border checkpoint at the Minsk National Airport and the visa-free stay in Belarus for up to 30 days for the citizens of 74 states. The information concerning hotel booking, transfer, excursions you can get from the official partner of competitions – "Time Voyage" LTD (address: 2, Tolbukhina St. Business center TIME, office 1317, Minsk 220012, Republic of Belarus, contact person: Veronika, mobile phone: +375 29 345 95 07, e-mail: sanker-cup@t-v.by). Offers on accomodation are available here. Event SANKER CUP 2018 at Facebook and Google+. Invitation to the SANKER CUP 2018 and the Regulations of the tournament (Russian only) are available below (here). The scheme of the competition area at "Minsk-Arena" velodrome is also available below. 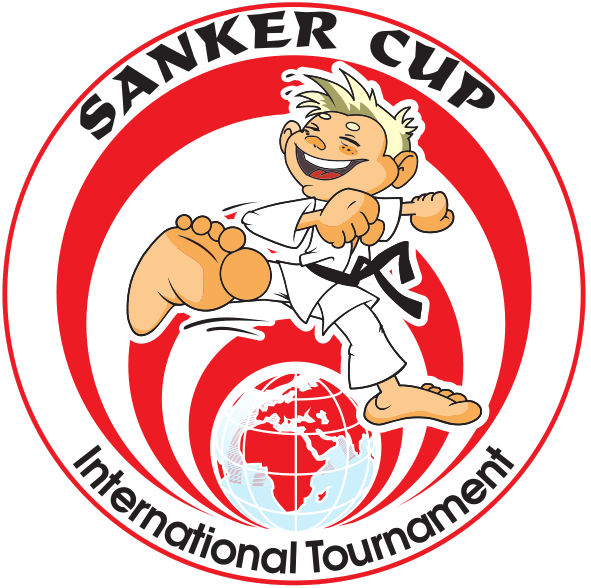 SANKER CUP - is the one of the largest karate (WKF) competition in Eastern Europe. Western and Eastern teams traditionally take part in. In the previous years SANKER CUP have given a good reception to karateka’s from Armenia, Azerbaijan, Belarus, Bulgaria, China, Estonia, Georgia, Iran, Iraq, Israel, Kazakhstan, Lithuania, Latvia, Moldova, Poland, Russia, Syria, Ukraine, Uzbekistan. We will be glad to see You and Your team in Minsk on our event! With best regards, Pavel Piatsko - Chairman of Association "Minsk Karate Federation". bed in a four-bed room with breakfast - $ 25.
bed in a triple room with breakfast - $ 30.
bed in a double room with breakfast - $ 35.
single room with breakfast - $ 35.
bed in a double room with breakfast - $ 30.
single room with breakfast - $ 50.
single room with breakfast – 81$. double room with breakfast – 108$. Studio room with breakfast – 123 $ (Single use), – 138 $ (Double use). Lux room – 109 $ (Single use), – 124$ (Double use). Association "Minsk Karate Federation" is pleased to announce the annual training seminar of the Japan Karate Shoto Federation (JKS) in Belarus under the leadership of YAMAGUCHI TAKASHI-7 Dan, the chief instructor of the Japan Karate Shoto Federation Hombu Dojo (JKS). This event is held within the framework of the Festival of Japanese Culture "Japanese Autumn in Belarus". The seminar includes 9 trainings (3 trainings for 9-5 kyu or for children, 3 Kihon + Kata trainings and 3 Kihon + Kumite trainings for 4 kyu and above), certification exam for Dan grades. Online-registration for the Minsk Open - SANKER CUP 2018 will be available from September 1 to October 9, 2018 at our site or . If you have never registered on www.sportdata.org or are having difficulties with registration, please check out the video tutorials (video in English, a brief descriptions of the registration process with the illustrations in Russian are given here - instructions were written few years ago, but has not lost relevance, scroll page down to the mark "КРАТКАЯ ИНСТРУКЦИЯ:", to view images in full size it is necessary to click on them). Questions relating to the necessity of registration athletes in the older age categories without fail should be coordinated with the Organizing Committee of the tournament. You will not be able to register such athlete in the senior age category - only Secretary of the tournament can do this (after agreement). To avoid confusion, please do not change the date of birth of the athletes. +375 29 6146 847, senko.club@gmail.com, minsk.karate@gmail.com (in English) - Elena. +375 29 6117 907, senko@bk.ru, minsk.karate@gmail.com (in Russian) - Pavel. INDIVIDUAL KUMITE FEMALE U10 -27 KG. INDIVIDUAL KUMITE FEMALE U10 27+ KG. INDIVIDUAL KUMITE MALE U10 -25 KG. INDIVIDUAL KUMITE MALE U10 -30 KG. INDIVIDUAL KUMITE MALE U10 -35 KG. INDIVIDUAL KUMITE MALE U10 35+ KG. 50,00 Belarusian rubles (about $ 26) with included breakfast (buffet). 70.00 Belarusian rubles (about $ 36) with included 3 meals a day (breakfast - buffet, lunch and dinner according to the menu). 40.00 Belarusian rubles (about $ 20) - with no food included. Single room - 160.00 Belarusian rubles (about 82.5 $) with included breakfast (buffet). Double room - 210.00 Belarusian rubles (about $ 108) with included breakfast (buffet). Single Suite - 235.00 Belarusian rubles (about 121 $) with included breakfast (buffet). Double Suite - 260.00 Belarusian rubles (about 134 $) with included breakfast (buffet). Family, triple, etc. Rooms - prices are available on request. Changes in the U10 categories updated in the new version of the invitation and at www.sportdata.org. Please note that the above prices for accommodation are valid only when booking through the official partner of the Tournament – "Time Voyage Plus" Company (address: 19, praspiekt Pieramožcaŭ, Minsk, 220004, Republic of Belarus, contact person: Eugene Mihina, mobile phone: +375 29 112 58 52, e-mail: sanker-cup@t-v.by). +375 29 614 6847, senko.club@gmail.com, minsk.karate@gmail.com (in English) - Elena. +375 29 611 7907, senko@bk.ru, minsk.karate@gmail.com (in Russian) - Pavel. Online-registration for the Minsk Open - SANKER CUP 2017 is available from September 1 to October 4, 2017 at our site or . 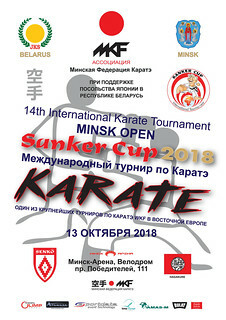 On behalf of the SANKER CUP Organizing Committee, we have the honor to invite You to the 13th International Karate Tournament "MINSK OPEN - SANKER CUP". Tournament will be held at October 6-7, 2017 in the one of the best European sports complex "Minsk-Arena". Registration for SANKER CUP 2017 is available from September 1 at and our site. Information on new rules of visa-free travel available at Ministry of Foreign Affairs of the Republic of Belarus website. The new rules introduce the visa-free entry through the border checkpoint at the Minsk National Airport and the visa-free stay in Belarus for up to 5 days for the citizens of 80 states. These are 39 countries of Europe, including the entire European Union, Brazil, Indonesia, the USA, Japan, and other countries. The information concerning hotel booking, transfer, excursions you can get from the official partner of competitions – "Time Voyage Plus" Company (address: 19, praspiekt Pieramožcaŭ, Minsk, 220004, Republic of Belarus, contact person: Eugene Mihina, mobile phone: +375 29 112 58 52, e-mail: sanker-cup@t-v.by). Event SANKER CUP 2017 at Facebook and Google+. Invitation to the SANKER CUP 2017 and the Regulations of the tournament are available below (here). The Organizing Committee of the tournament glad to inform you that this year's tournament "MINSK OPEN - SANKER CUP 2016" is supported by the National Olympic Committee of the Republic of Belarus Representative Office in Minsk. Prize for the best technique performance. Prize for the will and desire to win. +375 29 6146 847, senko.club@gmail.com (in English) - Elena. +375 29 6666 064, minsk.karate@gmail.com (in English) - Andrew. +375 29 6117 907, senko@bk.ru (in Russian) - Pavel. +375 29 3460 087, senko.club@gmail.com (in Russian) - Alexander. Referee Seminar - 17:00 October 7, 2016 in the conference hall "Calgary". Mandates Commission - 15:00-19:00 October 7, 2016 in the meeting room "London". contact - Eugene Mihina (tel . : +375 29 112 5852). accommodation at the hotel "SportTime" (★★) at very interesting price (location). Online-registration for the Minsk Open - SANKER CUP 2016 is available from September 1 to October 5, 2016 at our site or .